Ⅰ.Inner Mongolia Statistical Yearbook is a regular large scale statistical reference book published yearly.With a vast amount of statistical data for 2017,this yearbook reflects various aspects of Inner Mongolia’s economic society,science and technology development.It is really an important and efficient statistical reference book for people of various circles in and outside China to know and understand Inner Mongolia. Ⅱ.The yearbook has two parts:Special articles and Statistics.The first part consists of important documents of the Party and the government and Statistical Bulletin of the National Economic and Social Development in Inner Mongolia for2017.The second part consists of all the 24 chapters as follow:1.Division of Administrative Areas and Natural Resources;2.General Survey;3.National Accounts;4.Population;5.Employment and Wages;6.Investment in Fixed Assets;7.Energy and Environmental;8.Government Finance;9.Prices Indices;10.People’s Livelihood;11.General Survey of Cities;12.Agriculture;13.Industry;14.Construction;15.Transport,Postal and Tele-communications Services;16.Domestic Trade;17.Foreign Trade and Economic Cooperation;18.Tourism;19.Banking and Insurance;20.Education,Science and Culture;21.Sports,Public Health,Social Welfare and Other;22.Information of Leagues and Cities;23.Information of Banners and Counties(Districts and Cities);24.Appendix.In order to make it convenient for readers to consult,we edit exploratory notes on main statistical indicators of every chapter. Ⅲ.Most of the data in this yearbook sources are from annual statistical reports of government agencies,another part sources from sample survey. Ⅳ.Comparing with the content of Inner Mongolia Statistical Yearbook-2017,we changed the content as follow: The 17th part consists of Foreign Trade Economic Cooperation add index of Imports and Exports with “The Belt and Road”、Utilization of Foreign Capital by country,and adjust the layout. Ⅴ.The units of measurement used in this yearbook are internationally standard measurement units. Ⅵ.Statistical discrepancies due to rounding are not adjusted in this yearbook. Ⅶ.The notes concerning the whole table are placed at the upper part of table,while the notes concerning individual indicators are placed at the lower part. Ⅷ.Notations used in this yearbook:blank space indicates that the figure is not large enough to be measured with the smallest unit in the table,or data are unknown or are not available;”#” indicates a major breakdown of the total. Inner Mongolia Statistical Yearbook is a regular large scale statistical reference book published yearly.With a vast amount of statistical data for 2016,this yearbook reflects various aspects of Inner Mongolia’s economic society,science and technology development.It is really an important and efficient statistical reference book for people of various circles in and outside China to know and understand Inner Mongolia. Ⅰ.Inner Mongolia Statistical Yearbook is a regular large scale statistical reference book published yearly.With a vast amount of statistical data for 2016,this yearbook reflects various aspects of Inner Mongolia’s economic society,science and technology development.It is really an important and efficient statistical reference book for people of various circles in and outside China to know and understand Inner Mongolia. 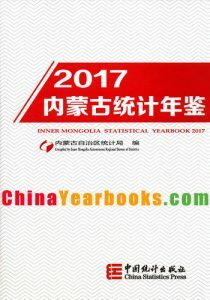 Ⅱ.The yearbook has two parts:Special articles and Statistics.The first part consists of important documents of the Party and the government and Statistical Bulletin of the National Economic and Social Development in Inner Mongolia for2016.The second part consists of all the 24 chapters as follow:1.Division of Administrative Areas and Natural Resources;2.General Survey;3.National Accounts;4.Population;5.Employment and Wages;6.Investment in Fixed Assets;7.Energy and Environmental;8.Government Finance;9.Prices Indices;10.People’s Livelihood;11.General Survey of Cities;12.Agriculture;13.Industry;14.Construction;15.Transport,Postal and Tele-communications Services;16.Domestic Trade;17.Foreign Trade and Economic Cooperation;18.Tourism;19.Banking and Insurance;20.Education,Science and Culture;21.Sports,Public Health,Social Welfare and Other;22.Information of Leagues and Cities;23.Information of Banners and Counties(Districts and Cities);24.Appendix.In order to make it convenient for readers to consult,we edit exploratory notes on main statistical indicators of every chapter. Ⅲ.Most of the data in this yearbook sources are from annual statistical reports of government agencies,another part sources from sample survey. Ⅳ.Comparing with the content of Inner Mongolia Statistical Yearbook-2016,we changed the content as follow: The 17th part consists of Foreign Trade Economic Cooperation add index of Imports and Exports with “The Belt and Road”、Utilization of Foreign Capital by country,and adjust the layout. Ⅴ.The units of measurement used in this yearbook are internationally standard measurement units. Ⅵ.Statistical discrepancies due to rounding are not adjusted in this yearbook. Ⅶ.The notes concerning the whole table are placed at the upper part of table,while the notes concerning individual indicators are placed at the lower part. Ⅷ.Notations used in this yearbook:blank space indicates that the figure is not large enough to be measured with the smallest unit in the table,or data are unknown or are not available;”#” indicates a major breakdown of the total. Ⅰ.Inner Mongolia Statistical Yearbook is aregular large scale statistical reference book published yearly. With a vastamount of statistical data, the yearbook reflects various aspects of Inner Mongolia’s economic society, science and technologydevelopment. 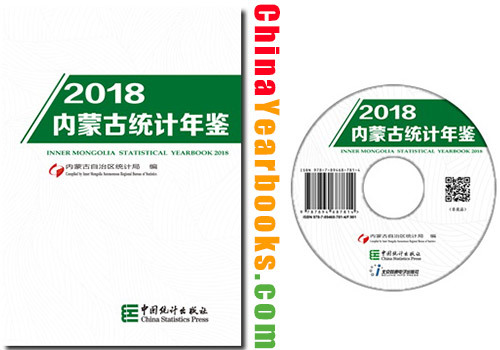 It is really an important and efficient statistical reference bookfor people of various circles in and outside Chinato know and understand Inner Mongolia. Ⅱ. Theyearbook has two parts: Special articles and Statistics. The first partconsists of important documents of the Party and the government and StatisticalBulletin of the National Economic and Social Development in Inner Mongolia for 2013. The second part consists of all the 24 chaptersas follow: 1.Division of Administrative Areas and Natural Resources; 2.GeneralSurvey; 3.National Accounts; 4. Population; 5.Employment and Wages;6.Investment in Fixed Assets; 7.Production and Consumption of Energy; 8.Government Finance; 9. Prices Indices; 10. People’sLivelihood; 11. General Survey of Cities; 12. Agriculture; 13. Industry;14. Construction; 15. Transport, Postal and Tele-communicationsServices;16. Domestic Trade; 17.Foreign Trade and Economic Cooperation; 18. Tourism;19. Banking and Insurance; 20. Education, Science and Culture; 21. Sports,Public Health, Social Welfare, Environmental Protection and Other; 22. Information of Leagues and Cities; 23.Information of Banners andCounties (Districts and Cities); 24. Appendix.In order to make it convenient for readers to consult, we edit exploratorynotes on main statistical indicators of every chapter. Ⅲ. Most of thedata in this yearbook sources are from annual statistical reports of governmentagencies, another part sources from sample survey. 1. Some of the published data since 2005 arechanged in this yearbook according to the second national economic census, therefore, data in this yearbook are reliablewhenever you find different data in other publications. The data of the thirdnational economic census will be Published in nextyear’s yearbook. 2. According to the reform of statisticalmethod in other industries, some data and tables of People’s Livelihood areadjusted. Ⅴ. The unitsof measurement used in this yearbook are internationally standard measurementunits. Ⅶ. The notesconcerning the whole table are placed at the upper part of table, while thenotes concerning individual indicators are placed at the lower part. Ⅷ. Notationsused in this yearbook: blank space indicates that the figure is not largeenough to be measured with the smallest unit in the table, or data are unknownor are not available;“#” indicates amajor breakdown of the total.